When my husband and I first looked for places to live downtown, we fell in love in with a tiny studio in a great area – the prime location, near shops and loads of public transportation, and the amenities (dishwasher, our own private washer and dryer) more than made up for the tiny space we’d be working with. Right away it was a challenge to figure out how were going to work with 315 ft² of living space. And the most important item we had to buy was a bed. When we searched online, the best and cheapest thing I found was CollegeBedLofts.com. Although there were a select few other companies selling adult-sized loft beds, most were very expensive and had loads of bad reviews, complaining about shakiness, unsound structure, and smallness. The reason we chose College Bed Lofts was because it combined a sturdy structure with self-assembly (which makes it a whole lot cheaper! ), and personalized sizing/add-ons (you can request shelves or desks underneath your bed, or keep things simple if you want). 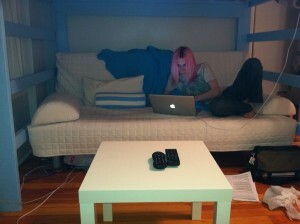 It simply doubled our living space by allowing us to use the area underneath the bed. It also allows to have a “private area” even though everyone who passes through or visits will essentially be in our bedroom. Our bed is up high, and our living and working area is underneath. It also means we can leave the bed undone – no one will see this! 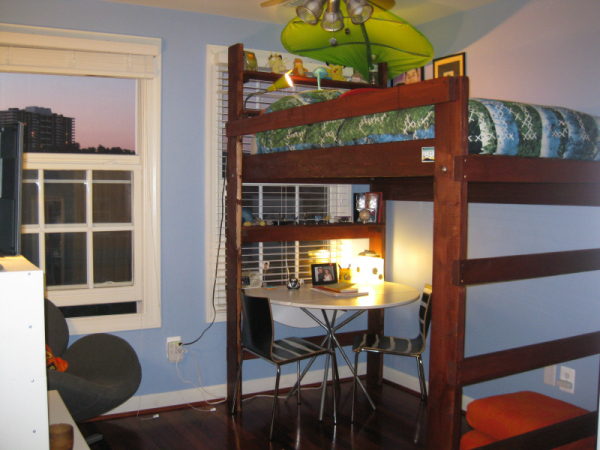 A Queen-size College Loft Bed like ours wasn’t cheap though. It cost $400, and we had to build it and paint it ourselves. The work was fun but definitely not easy, and if you’re not prepared to build and finish your own bed, this might not be for you. It’s also a little tricky to get into, so if you’re accident prone or unable of climbing a ladder, a loft bed won’t do. However, a bed like this will last you a long time and is incredibly sturdy. Ikea makes loft beds that only go up to a full-size (also known as double-size), which might not be comfortable for two full-sized adults. They are significantly cheaper but several of the reviews I’ve read warn against their infernal creakiness (if there’s one thing that kills the mood it’s a squeaking, swaying bed six feet above the ground!). The major reason we did not get an Ikea loft bed was the weight restrictions. Although neither of us are especially heavy, any exertion you create increases the weight the bed has to accommodate. Basically, if you’re jumping up and down, a bed has to be much stronger than if you’re just lying still. Both of us are rambunctious sleepers, and moving in a bed creates a lot more force. 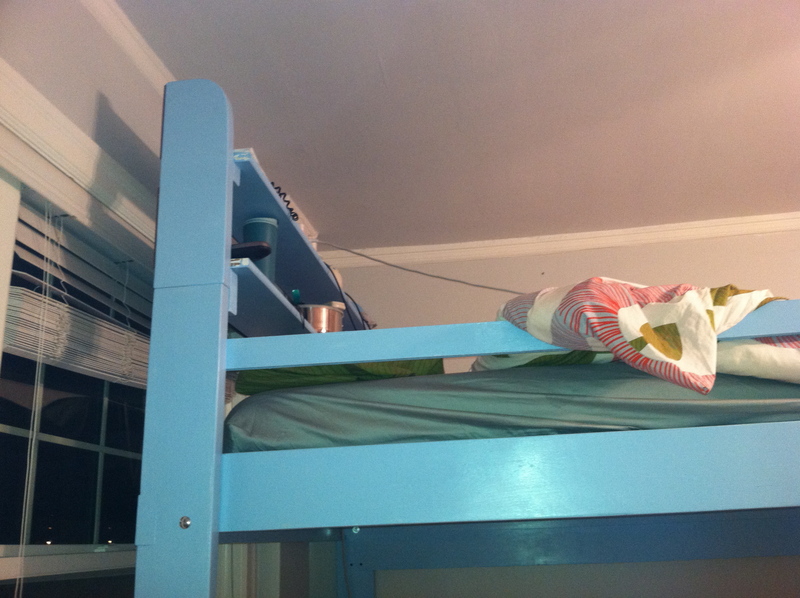 In any case, if you are tossing and turning or moving around in your bed, you’ll want to spring for a stronger structure, like the College Loft Bed. The major bonus of getting an Ikea loft bed would be that we wouldn’t have to paint and finish it ourselves, although personally I really love looking at the bed that Shaun and I worked on together. It’s our favourite colour and it brightens our room. I also like how secure and strong it is. Anyway, it’s been a few months since we ordered, bought and built our loft bed, and it’s definitely been something I feel I can recommend to anyone trying to live small and make use of precious space! I usually like to look up who else is endorsing a product/what awards its won when I write a review, and I read that Dr. Phil offered a youth-sized versions of the bed we got to a family that came to his show for help last year (pictured right). 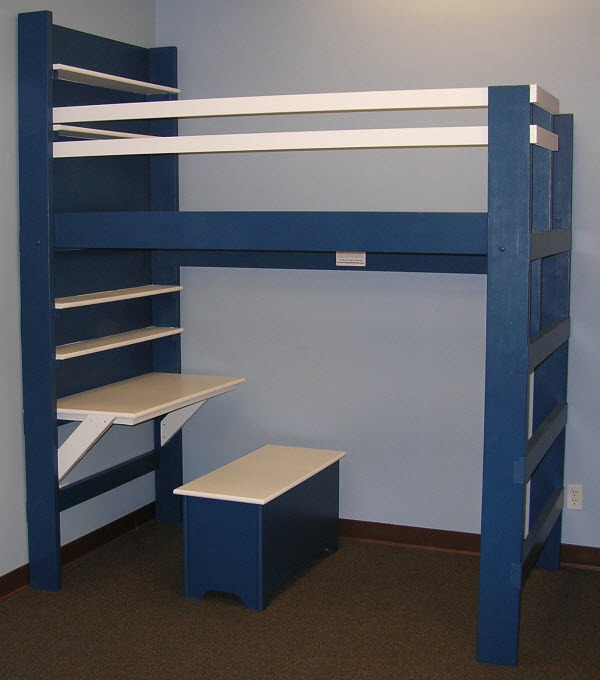 So it seems that even though this company markets itself to college students in need of more living space, they also do a great job making custom beds for children and adults. They also ended up donating some loft beds for a family with boys on Extreme Makeover last year, and are currently listed a show sponsor. So far, this bed is the #1 space-saver in my studio and has inspired us to look at more space-saving furniture and electronics. Living small can actually be fashionable and fun! Hi. Thank you for a comprehensive review. I’m looking into buying a loft bed from this company. My only concern being that they use spruce wood which is a soft wood. Is this bed holding up well for you? Did any part of it crack or break? Does it shake or move at all? Are you still finding it to be strong and durable? Any info would be appreciated. Thank you. Sam. I purchased the plans option from college bed loft.com and set to work with my five and six year olds to build bunk beds. It wasn’t exactly easy, because I should have had adult help, but I did it! I made ours from douglas fir. I built the back rail option and not the plywood on the back. I made them twin xl. I love this bed! It is rock solid. Next I want to build a queen size one for my room. I have heard that the hardwear is difficult to find, but I found it easily at my local Orchard Supply Hardware. 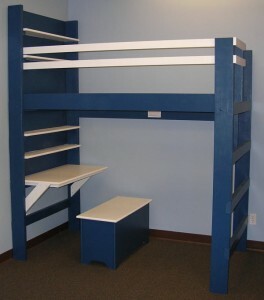 You may also want to check out the web site https://www.elitedecore.com/item–Heavy-Duty-Solid-Wood-Loft-Bed-1000-Lbs-Wt-Capacity–1.html. They make a similar bed out of Premium Douglas Fir for a lot less money. They also have a lifetime guarantee. These reviews baffle me. My loft sways in the breeze every time I move a muscle, let alone try anything else. So u h for a young guy in the city. I have done everything they said and it’s still beyond rickety. Don’t get it. So frustrating and disappointing.